I love data visualisation; sometimes just for its own sake, but mostly when it makes life easier. 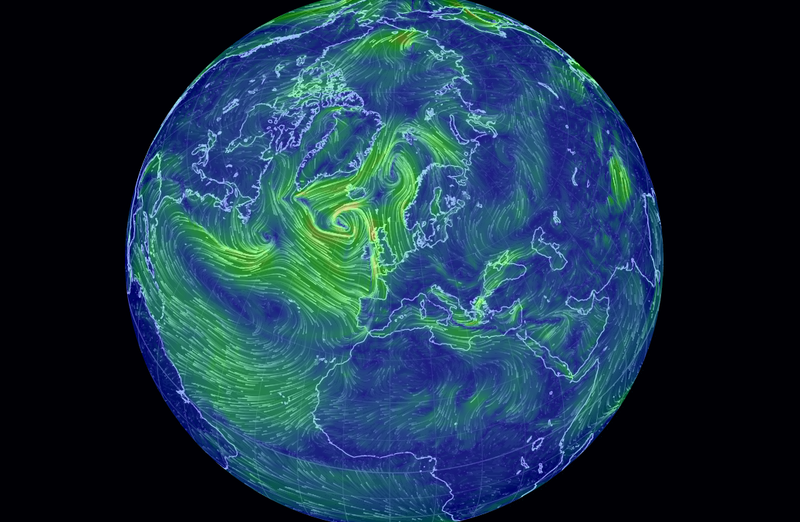 The Earth Wind Map is an example of the former. It's hypnotically beautiful. This type of data visualisation isn't so good in business though, except to use as marketing material. If you want to build a stunning animation of your customers' behaviour to put on a big screen in the office, that's great, but watching it for five minutes every Monday morning is unlikely to help you identify problems with your website. If we want to gawp at something beautiful, we call up the Earth Wind Map; if we want to know whether to take an umbrella tomorrow, we go for a simpler forecast. In business - and I count non-traditional businesses like sport within this too - data visualisation has two main purposes. To help you understand the best strategy to adopt. To get you to that strategy faster than you otherwise could have. In order to achieve those ends, I work to three simple rules when visualising business data. The ideal business report, (visualisation, dashboard, call it whatever you like), should achieve these three things as quickly and as simply as possible. The higher up the management chain the report's audience, the simpler it needs to be and the more 'added extras' become a distraction rather than useful additions. I'm not dismissing visualisations for inspiration, or for investigation, but in business the aim of communicating data is to make the right decision and to make it quickly. This is what reports are for and so I try to design reports to communicate these three things. For the metrics that you know are important (you have identified those metrics, haven't you?) Where are they right now? This could mean yesterday, a total for the past seven days, a summary of the last fixture your sports team played, or any other - relatively short - time period that works for the business. "As analysts, we're often the ones selling dashboards, so lets be honest about what they do well. They show data. So to be useful, you have to be someone who needs to see that data - and I mean really needs to see it. Just the number. Not why the number, or where it came from, or what you might want to do about it." Only visualise metrics where you fully understand what they mean and know at least some of the levers that you can pull to make them change. If sales drop, you know what that means. If some single number that's a complex blend of customer values, retention, acquisition, marketing ROI and God knows what else changes, what are you going to do about it? Simplicity is good. It's also much harder than complexity. To divert into my football analytics sideline for a moment, this is why I'm not a big fan of numbers like PDO. The definition is complicated, the name is confusing and as a manager it's hard to know what to do about it, when it's not where you'd like it to be. That's not to say there shouldn't be complicated metrics (for example to use as predictive tools) but I don't want them on my management visualisation. Very often, the best way to communicate some simple KPI numbers is a simple table. Who says a data visualisation can't be 'just' a table? In the right place, tables are awesome. 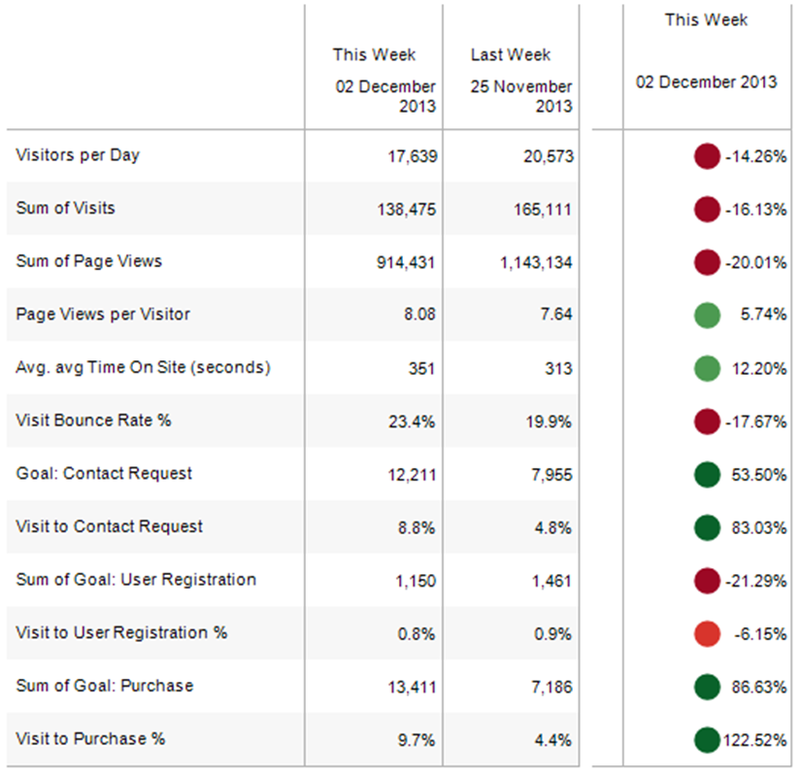 Here's a visualisation of website metrics, that will work well provided you already know a bit about your website. So now I know how much I sold last week and how much traffic we got to the website. But is that good? Put each number in context. Context can mean a comparison with the past, or with a fixed target, or even vs. key competitors. It doesn't matter how you do this - colour coding, text flags, Harvey Balls - as long as it communicates quickly and clearly. Personally, I'm quite partial to an old school traffic light, if only because even in the marketing industry, it's hard to find somebody who can get 'green is good' wrong. 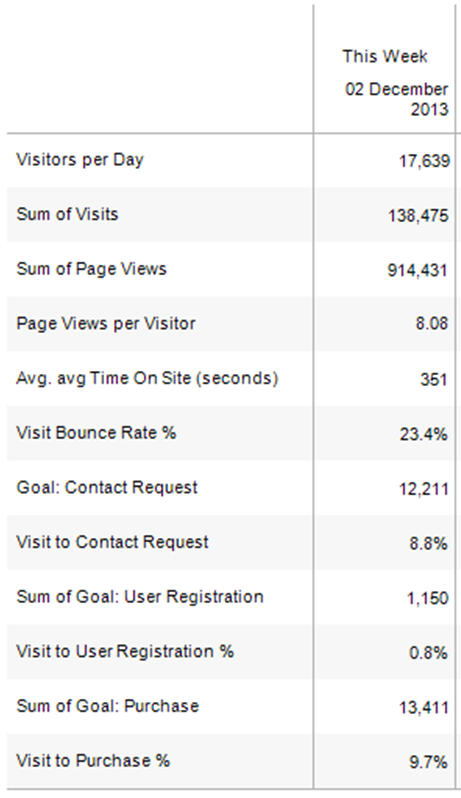 Our weekly table of web traffic stats gains week-on-week or year-on-year comparisons and a set of traffic lights. Now you can instantly see if any of these numbers need attention. The last piece of the puzzle is to know if your metrics (otherwise known as KPIs - this isn't revolutionary stuff!) are changing. Part one told us where we are. Part two told us if where we are is good. Part three tells us if the position is becoming better, or worse. This section is where things can get overcomplicated if you're not careful. If you've got eight KPIs and you want to show a twelve week trend, then you've now got ninety six numbers to communicate. Tables just became a really bad idea. Sparklines are mini charts designed only to communicate spikes and trends in data. All this section of the report is designed to do, is to give a manager a quick visual representation of 'going up', or 'going down' and how fast. 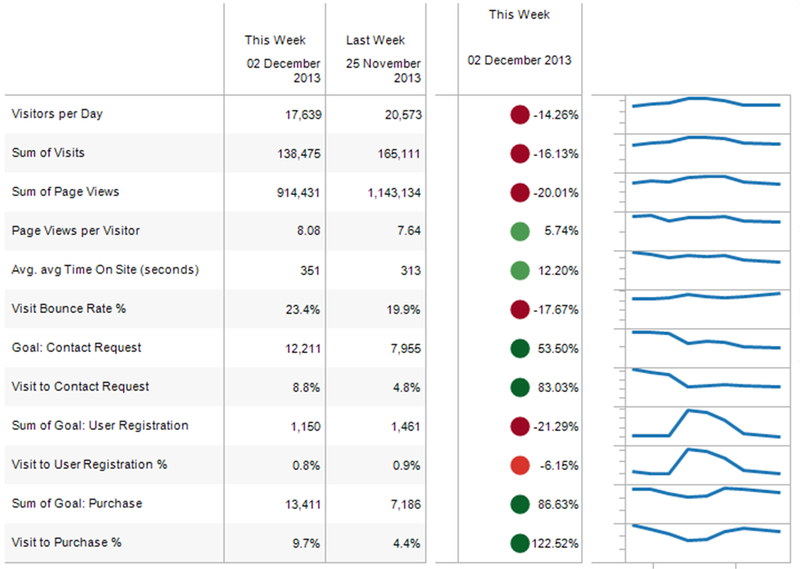 Our website report gains a set of twelve week sparklines and we're done. In one small report, we can see at a glance where we are, whether that's good and whether it's getting better, or worse. I love data visualisation, but in business, we need to drop the pretty pictures and understand why we're visualising in the first place. Infographics are awful for communication. They're actually worse than writing down your report as long-hand text. If a business visualisation doesn't help you to understand the best strategy to adopt and do it faster than a table of numbers would, then it's not worth having. Build infographics (if you must), learn D3 and build beautiful animations, but recognise that they're marketing collateral, not serious business tools. In business, we need to know where we are, if that's good and if it's getting better or worse. The longer it takes to communicate that, the further behind your competitors you'll be. Excellent guidance to get to the important message a visualization should be communicating. Thanks for making a stand for simplicity! Excellent post and great differentiation on how to build visualizations for business. We are trying to make it easy to build visualizations at https://datahero.com . Give it a try and we'd love your feedback.